Paddock Road Elementary School (Omaha, NE). 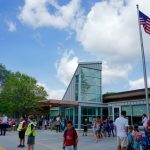 Paddock Road Elementary emphasizes personalized learning for all students. To increase student engagement and learning, the school focuses on getting to know students’ strengths, interests, skills, and abilities. Using that information, the school creates a variety of classroom, schoolwide, and after-school opportunities for student voice and choice. In the spring, Paddock offers enrichment clusters in which students have a voice and choice in classes based on their interests. Third through sixth grade teachers use I/E (intervention and Enrichment) time to actively involve students in their learning through passion projects. For six weeks, students participate in school-wide enrichment classes (e.g., sea animals, movie-making) to create authentic products of interest. For differentiated student interventions, teachers use screenings, intervention graphs and logs, for instruction in small groups. During the school year, the Personalized Learning Workgroup provides additional resources and ideas for teachers to differentiate instruction. The school’s library has a Tinker Lab for students to explore and create various robots and kits (e.g., building circuits or structures). Other learning opportunities include 6-8 weeks of Fine Arts Clubs after school. Teachers, parent volunteers, and paraprofessionals teach these clubs. Topics may include writing, performing arts, dance, and yoga.